It's only June 2nd, but already SuperPhillip Central has its first review of the month, hot off our look at May's reviews. It's for an early release in May that originally appeared on the Wii U two years ago. It's Elliot Quest for the PlayStation 4, Xbox One, and Nintendo 3DS with the PS4 version being what this review was based on. There are a multitude of games that have gotten inspiration from the original Legend of Zelda on the Nintendo Entertainment System. However, it seems like its sequel, Zelda II: Adventure of Link doesn't receive half the love from fans as well as developers, but Ansimuz Games happily took direct inspiration from Link's second NES adventure with its take on the 2D action-adventure side-scroller formula. 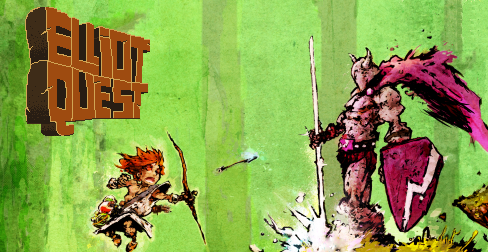 The end result is Elliot Quest, now available on PlayStation 4. Xbox One, and Nintendo 3DS. Starting off in the game, Elliot is limited in his abilities. All he can do is jump and attack through the means of unleashing an unlimited supply of arrows from his bow. As Elliot defeats enemies, he's gains experience in an RPG-like leveling up system that grants him a skill point for each level he reaches. Skill points can then be used to upgrade one of five categories which affect everything from how fast Elliot can fire arrows, how much of a reach his arrows have, possibilities for critical hits, the chance to heal double the health from a single heart, and much more. Obnoxiously, death results in a loss of experience, and considering how easy it is to die in Elliot Quest, you might find Elliot stuck at a specific level for a slightly extended (and frustrating) period of time. The first main area to play around in here in Elliot's journey. The goal of Elliot Quest is to satisfy... Elliot's... quest... *clears throat* of defeating four guardians around the island he inhabits. There's certainly some mystery surrounding what accomplishing this will do, but that adds to the mystique of the story. Some characters encourage you throughout your mission while others ridicule you. And all this lava serpent wanted was a vacation here in the Fire Temple. Now he's about to be another number on Elliot's kill count. The guardians are located in four temples spread around the island. These feature some really clever puzzles, fierce enemies of great varieties (part of the fun is figuring out how to best beat a particular foe), tricks and traps to worry about, and plenty of platforming opportunities to engage in. Like a typical Zelda game, these temples possess things like maps, keys to unlock doors, a Master Key which opens right up to the boss chamber, and a special item that allows full access to the entire dungeon. Guardian battles are enjoyable and tough bouts that really demand persistence, patience, and uncover just how to deal damage to the foe. 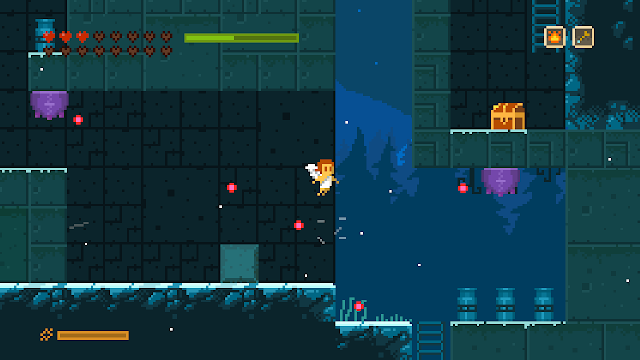 After a guardian in Elliot Quest is defeated, a temple in the southernmost beach of the island has one of its pillars light up. The Ice Temple's guardian looks rather heated for an ice-based boss! The majority of gameplay and time spent in Elliot Quest isn't even in the guardian temples. 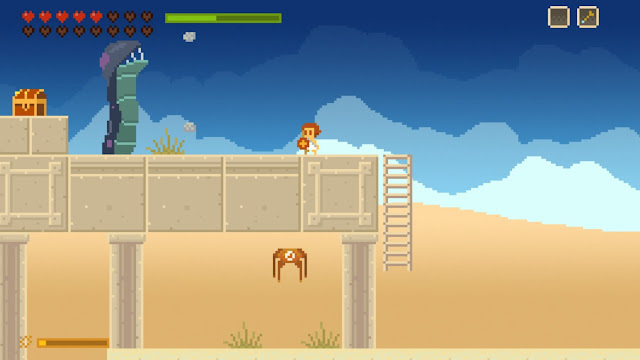 The island is home to forests, deserts, caves, mountains, and plains that have an equal amount of platforming, exploration, and combat to them. There is no shortage of treasure chests to uncover, heart pieces to acquire, magic meter upgrades to nab, and goodies to discover. The island itself is traveled around on a world map, not unlike Zelda II's. It even has enemy sprites that result in enemy ambushes in open field areas. Locations that Elliot can enter and discover are marked with an exclamation point once he reaches them, so thorough exploration is a must if you want to find everything in the game: all the items, all health upgrades, all of the destinations, all of the crystals, all of the optional (and quite difficult) bosses, and bonus dungeons. Rock-spitting sand worms? Just another day in the desert for Elliot. The world map is open and especially after the second half of the island is available to explore, there are a plethora of destinations that Elliot can visit. A problem with this is that it might be a bit too open, as many times I would enter a new area only to get halfway through with a door requiring a certain number of crystals that I didn't have or a platform that required a special item I was lacking. This resulted in a lot of backtracking, and of the most tedious kind, to be found in Elliot Quest. Fast travel is limited to a consumable feather that automatically transports you to a specific town. Otherwise, you have to move from one side of the island to the other on your own, with each major section divided up by an area you must play through. That said, shortcuts do open up from time to time as new special items and magical abilities are earned and learned respectively. Until they do open up, however, backtracking is a mandatory thing. As stated, Elliot earns and learns a nice and varied amount of special items and magic. Each guardian defeated opens the way to a new magic ability, such as the power for Elliot to launch flames from his bow, incinerating wood with ease, or the ice magic, allowing Elliot the ability to freeze enemies and use them as blocks to reach higher places. 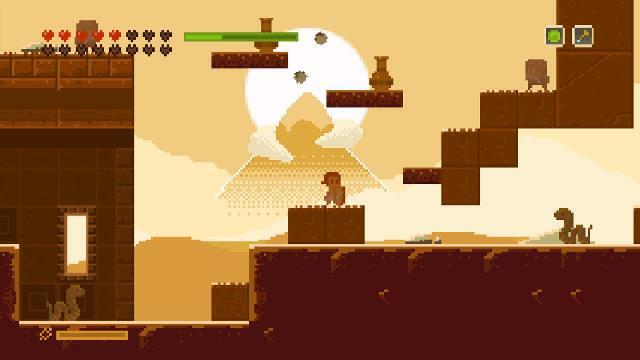 On the special item side, things like double jumps, dashes, bounces off the heads of enemies, and more are gained for Elliot to more easily venture across the island and defeat foes. Yearning for more air? Get the double jump ability for Elliot to reach higher areas. Elliot Quest is quite a lengthy journey, and especially so if you're playing blind (i.e. without a guide or help of any type). There's a significant amount of things to find, places to uncover, and bosses to take out. There are also three different endings, depending on how you play, though beating the game three times with slight changes in what you do to get the good, neutral, and evil endings might be a bit much, even for achievement and trophy hunters out there. Speaking of which, I know at least one achievement/trophy is impossible to get currently, one which requires you to get the Forest Maze map. Without fail, the game crashes every time you enter the room where the map is supposed to be. While we're talking about performance, Elliot Quest sports some pleasant retro art. The sprites themselves don't do much to impress for me, but they are all serviceable. What truly amazed me were the backgrounds and color palettes on display. Having Elliot and enemies show up in silhouette form with a beige desert background in the distance was one of the highlights for me visually. Then, there is just the immaculate amount of details in the environments and architecture that I really enjoyed seeing. The music of Elliot Quest is more A Link to the Past-inspired rather than Zelda II. Hey, if the gameplay is pretty much Zelda II-based that doesn't mean the entire game has to be! 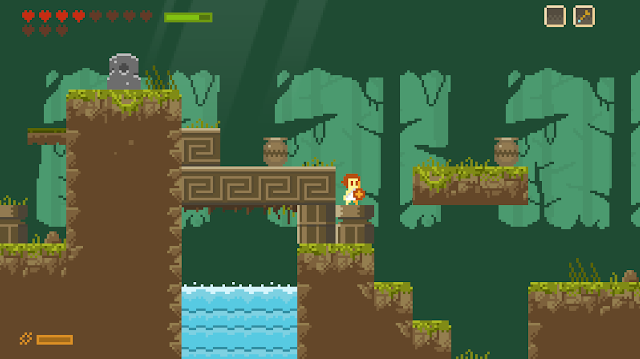 The environments of Elliot Quest are the most appealing to me in this presentation package. 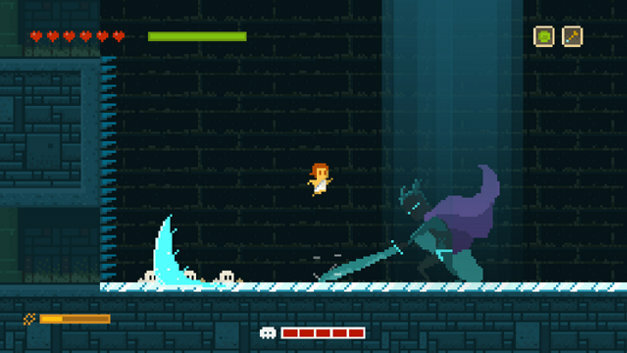 Elliot Quest is a really rewarding and quite challenging game. It's mostly rewarding after getting through a particularly challenging section of the game, or finding a super secret item or passage on your own without any help. It certainly takes a page out of Zelda II: Adventure of Link, but it also writes its own unique and original chapters to form a book that doesn't feel like some lame "wannabe" of Nintendo's game. Instead, it feels like a remarkably crafted game that has its own personality, original mechanics, and engrossing island to explore. Review copy provided by PlayEveryWare.